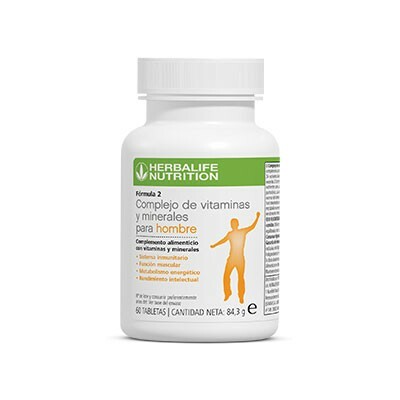 Discover Formula 2 Vitamin& Mineral Complex Men, your easy route to 24 nutrients to support what your body needs. It contains essential vitamins and minerals in just the right amounts to target the daily health needs of men. Tailored to the individual health needs of men. Provides the optimal amount of key vitamins and minerals that your body needs. Delivers 71 individual EU authorised claims. Developed by experts in nutrition and backed by proven science. Formulated to work in conjunction with your favourite formula 1 shake. Contains vitamin A& C which contribute to the normal function of the immune system. Contains magnesium which contributes to normal muscle function. Contains riboflavin which contributes to normal energy yielding metabolism. Take 2 tablets daily with food. 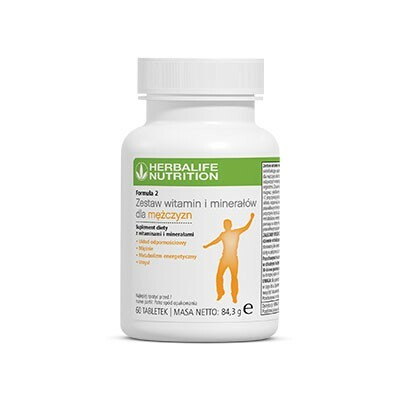 For the ultimate in daily nutrition use this product in conjunction with Herbalife Formula 1 Nutritional Shake Mix. Take 1 tablet a day if you are taking 2 shakes a day, and 2 tablets a day if you are taking 1 shake a day. Why is it important to take a multivitamin food supplement regularly? Why is it important to take a gender-specific multivitamin? *In addition to a healthy balanced diet and an active lifestyle.